David Beckham. In a suit. Driving a speedboat. Need I say more? Certainly not, but I should. Also on board, the Olympic torch, which he drove up the River Thames into the poor East London neighborhood he grew up in. In a real life James Bond moment, Bond (I mean Becks) seamlessly arrived at the dock and transferred the torch to…some British athlete…simultaneously lighting up a dark and forgotten corner of the city and hearts around the world. Women hearts. Mostly. Was there ever anything more suave and debonaire? Will there ever be? 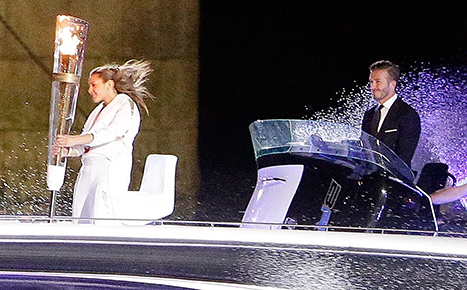 Becks and his Olympic speedboat driving actually inspired a weekly column in Pigskin ‘N Pearls. So, let’s here it for…Becks, the inaugural Crushing feature, and the Olympics. David Beckham may not win gold, as he was unexpectedly left off the British football squad. Shame on them! But he won our hearts as a football player (I know, wrong kind, but still…), underwear model, and now as British spy/Olympic speedboat captain. Best of all, Beckham re-signed with the LA Galaxy (American Pro Soccer team) this year, saying his family is happiest living across the pond. He told Britain’s Mail Online, “We love living in America. We’ve adapted to the culture and everything the country has.” Freedom…and Becks. Now we really have it all! US-2, GB-0. I would like to dedicate this premier column to my sister, Jenny…who I know agrees. This entry was posted in Olympics and tagged Crushes, David Beckham, NBC. Wow… I am not only incredibly surprised, but extremely excited! I get to call my sister and discuss with her a new-found commonality! And it ain’t American football! I had no idea she had these feelings lying dormant inside her. I have forever been a Beckham fan – through his days of ponytails, samurai coifs, painted nails, and now, tailored suits. I even love his choice in partners… yes, Miss Posh. I love everything Beckham… even renaming a famous Indiana dessert, “the Robert Redford” the “David Beckham.” Heather, welcome to my world… it is a beautiful one!